ISU landscape architecture students create restorative outdoor space for prison employees. Downloadable photo by Bob Elbert. 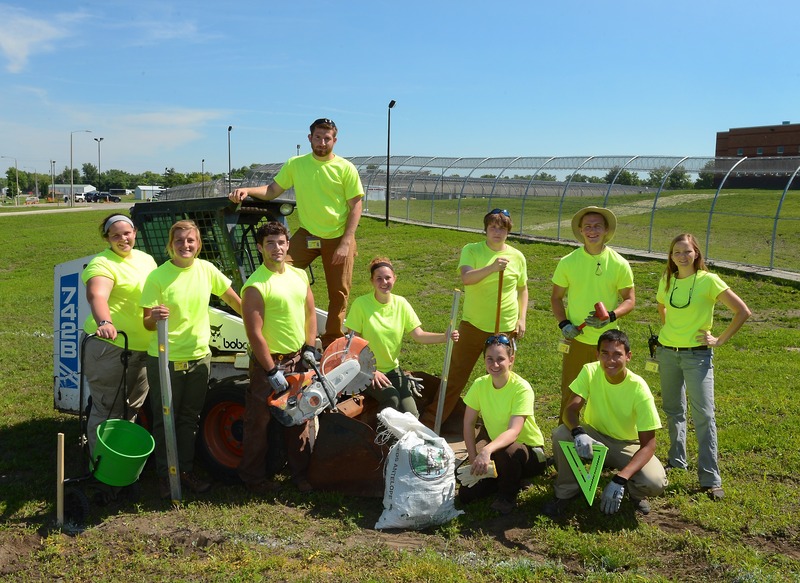 AMES, Iowa -- Last summer, while Julie Stevens' students built outdoor classrooms as part of the Iowa Correctional Institution for Women's $68 million modernization and expansion, they noticed a daily occurrence that inspired their project for this year. "During shift changes, the correctional officers stood in the parking lot next to their cars, talking to each other about their shifts," said Julie Stevens, assistant professor of landscape architecture. "They'd stand there for 45 minutes just to decompress and chat — so they wouldn't have to take the day's stressors home with them." So, this summer, Stevens and nine landscape architecture students are designing and building an outdoor decompression area specifically for correctional officers and staff. It's adjacent to the new ICIW administration building, which opened last fall as part of the massive construction project's first phase. Work is continuing on phase two this summer. A bird's eye perspective of restorative outdoor areas adjacent to new administrative building. By Tim Buescher. Working as paid interns, the students are getting a design-build experience like no other. "I wanted to see a project from a design on our computers through the built project," said Lauren Iversen, a senior from Waukee. "This was a great way to do that in a short amount of time. And you wouldn't find another internship that includes working with the demographic of offenders. It's an experience hardly anyone else will have." Initially, prison employees weren't convinced they'd benefit from a restorative outdoor environment, Stevens said. "I think they felt like working in a prison will always be stressful. So we've been talking to them about how it's important for everybody to have a positive work environment that includes restorative spaces," she said. "It's difficult for them to get away from their jobs even for a few minutes," said Branden Pentico, a senior from Perry. "We want to give employees an area with the amenities that people need to really relax on breaks, during lunch, or before and after work." Eventually, the employees came around and even gave the design students their wish list. Warden Patti Wachtendorf wanted a magnolia tree and memorial garden in honor of past employees. Correctional officers and staff wanted a space that could accommodate several dozen people for occasional staff barbecues, as well as small group team meetings. And they all requested a variety of sitting and leaning options that offered shade, privacy and wind protection. The students listened. Working together, they created a landscape design that checked off all items. The memorial garden in front of the administrative building will include a water feature to honor a past warden and a magnolia to reflect one demolished on the old campus. A tree-lined path will lead from the staff entrance sidewalk to the hardscape decompression patio and windbreak on the north side of the building. Decompression patio. By Austin Javellana. The three-tiered, 30-by-40 foot patio will feature a variety of small group and private seating areas, a built-in grill, and a vegetative privacy wall of clematis. And it will feature an element that has the students and their professor intrigued: leaning walls. "Officers told us that when they work the night shift, they get tired if they sit down. So they lean. We're building leaning walls specifically for that purpose. They're about 4 feet high so officers can lean and rest without feeling sleepy," Stevens said. Tim Buescher, Jacob Brouillete and Branden Pentico begin work on employee entrance. Photo by Bob Elbert. "The students did a phenomenal job," said Todd Givens, correctional officer. "They listened to our ideas and wants, worked around restrictions that one would not have on a normal project. They took our suggestions and came up with a design that not only met our expectations and wants, but in my mind, exceeded them. Working four 10-hour days a week through July, the students are digging out the paths, excavating the patio and laying out their design, which calls for limestone (left over from last year's construction), and gravel, brick and concrete pavers (which they hope to have donated, along with planting materials). Stevens is thrilled that the mason from Hanson Masonry, Owen, Wisconsin, who did the prison buildings' brickwork, is returning to teach the students how to build masonry walls. And he's donating the materials. The windbreak has posed a design challenge. Many plants typically used in Iowa windbreaks are increasingly susceptible to diseases (green ash and Scotch pine), drought (white pine) or are invasive (honey suckle). So the students specified plants not typically used around here, making the prison grounds "a bit of a test site where we can follow the outcomes of different plants," Stevens said. Correctional Officer Todd Givens and Warden Patti Wachtendorf visit with the students about the employee entrance path they're building. Photo by Julie Stevens. "We tried to bring in plants that are visually interesting and will withstand the wind," said Madison Dierks, a senior from Des Moines. With advice from ISU Extension and Outreach specialists coupled with the students' research, Dierks said their windbreak design calls for red twig dogwood, hazelnut, Ponderosa pine, white spruce, hackberry, buttonbush and witchhazel. And a grove of aspen that fades into the windbreak will tie into the planting design inside the security fence.Outdoor classrooms plants. Bounds' design includes silky aster thimbleweed, alumroot, prairie petunia, as well as sedges, grasses and a hillside grove of aspen trees. The thin trunks of aspen trees grow tall and the foliage can be kept at a level higher than six feet, a necessity for security and surveillance inside.On the grounds inside the fence, a team of students and offenders is planting grass, trees, and native plants around the outdoor classrooms. They're following the planting design created by Tara Bounds, a graduate student from Orion, Illinois, and Stevens' teaching assistant. After graduating from Drake University, Bounds worked in a native plants greenhouse and has extensive experience in prairie restoration. In addition to helping the students plant, offenders will maintain the prairie beds and other plantings around the outdoor classrooms, which already are in use. The offenders not only appreciate their new outdoor environment, but also look forward to maintaining it — even pulling weeds. They are the first to praise the students' work, with comments like "they did a wonderful job," "the students have put hard work into that," "it's really nice to have room for everybody to sit," "these guys are awesome" and "we can't believe they did this for us." Students and offenders plant. Photo by Bob Elbert. "And we enjoy returning the praise for a job well done," Stevens said. "The women on our crew have worked exceptionally hard and are dedicated to making the project successful." "I've watched the students interact with officers, support staff, counselors and all the way up to the Director of Corrections," said Warden Wachtendorf. "I've watched them talk and listen to the offenders and work side by side with them. They are always professional, kind and have found themselves in the teaching role instead of just being a student." Stevens is already looking ahead to the coming year. Grad student Bounds is designing a community park for outside the security perimeter that will be tied into local bike trails. And her students next year will design a new kitchen garden and production greenhouse to replace those wiped out by the construction project. Stevens says she and her students won't be finished until the mother-child garden — her favorite project — is installed. She's also writing a couple of book chapters and some journal articles about this unique ongoing learning and service project. And Iowa Department of Corrections Director John Baldwin has asked her to create a design for the new men's facility in Fort Madison. "This has been such an incredible design challenge. Nobody ever thought we'd get this built, but we did and that part is incredible." Looking toward grass mounds (covered by erosion control matting). Photo by Bob Elbert. Looking toward classrooms. Photo by Bob Elbert.Photo by Bob Elbert. Tiered classroom. Photo by Bob Elbert. As a follow up to their outdoor classroom project for offenders last summer at the Iowa Correctional Institution for Women, ISU landscape architecture students and their professor are designing and building an outdoor decompression area specifically for correctional officers and staff. It's part of the ICIW's $68 million modernization and expansion. Working as paid interns, the students are getting a design-build experience like no other. "I've come to realize that the constraints of the project have actually made for the best opportunities. Because I have never limited the students' ideas." "We want to give employees an area with the amenities that people need to really relax on breaks, during lunch, or before and after work." "And you wouldn't find another internship that includes working with the demographic of offenders. It's an experience hardly anyone else will have." "We can't believe they did this for us." Lauren Iversen and Tara Bounds planting. Photo by Bob Elbert. Austin Javellana, Katy Hamerlink and Lauren Iversen planting. Photo by Bob Elbert.